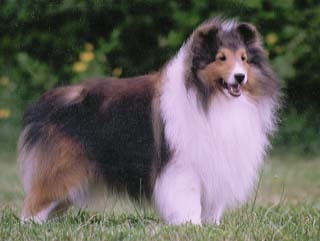 Ch Jade Mist Beyond Tradition ROM: Sable and white dog (tri- and white-factored), bred by K. and C. Howell and whelped February 10, 1989 by Ch Glademist Dueling Banjos ex Jade Mist Social Climber. "Dillon" is the sire of 35 Champions. Line CHE Part IIb, and Family 4.